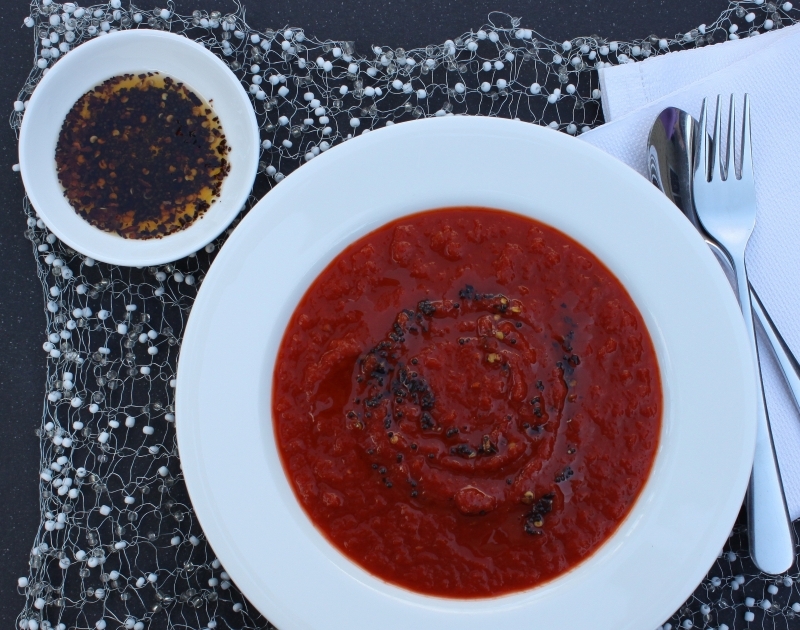 It is time for soup in our part of the world and this roasted capsicum soup with spiced oil is a wonderful change from the usual pumpkin or potato and leek soup that are favourites in our family. The capsicums are roasted and then gently simmered with some tomatoes, garlic and vegetable stock. Roasting capsicums makes them incredibly delicious. It’s a messy job peeling off the skins once they have been roasted, but it is not at all difficult and the result is so good it makes sticky fingers completely worthwhile. 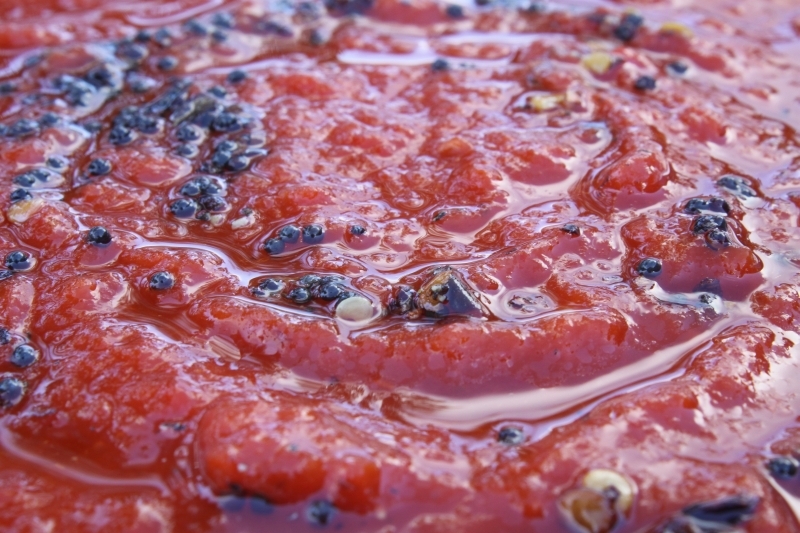 My sister taught me the method of tempering a little olive oil with chilli and mustard seeds as a way for everyone to add their preferred amount of heat to a dish. In this soup it adds fantastic pops of spiciness along with the slight sweetness of the capsicums in every mouthful. It looks so vibrant and fresh and tastes wonderful. Serve it with thick, crusty bread for a simple Sunday night supper or Saturday lunch. Preheat oven to 180 C. Put the capsicums on an oven tray and roast for about 40 minutes until the skins are beginning to blacken. Take them out of the oven and as soon as they are cool enough to touch without burning your fingers peel off the skins. They should slip off very easily. Carefully remove the seeds and then chop up the capsicums and place in a medium saucepan. 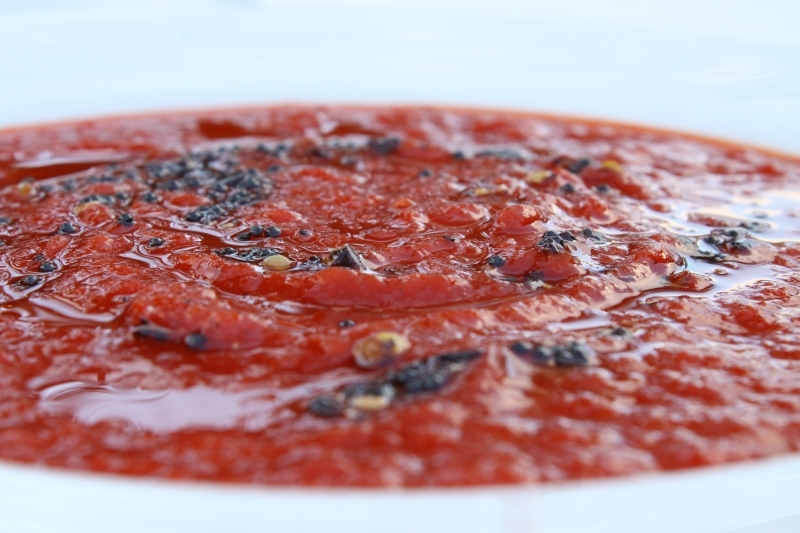 Add the tomatoes, finely chopped garlic and the vegetable stock and break up the tomatoes with a spoon. Simmer for about 15 minutes and then, using a stick blender, or in a food processer, whizz until fairly smooth. Season with a little sea salt and serve with the spiced oil on the side for everyone to add according to their taste..
To make the spiced oil, warm the olive oil with the mustard seeds in a small pan until the mustard seeds start to pop. Add the chilli flakes and a good grind of black pepper and sea salt. Cook for a couple of minutes. Take off the heat and serve warm with the soup. Mm. That color! What a beautiful post. Thanks gorgeous girl. Thinking of taking a day trip up your way soon and would love to hear all about your amazing trip.